A picture is worth a thousand words – and the same can be said about your work on the PC. For colleagues and friends that want to know something about a PC or a specific program, it makes sense to hold it in a screenshot to help highlight exactly what you would like to show, for example with paint. 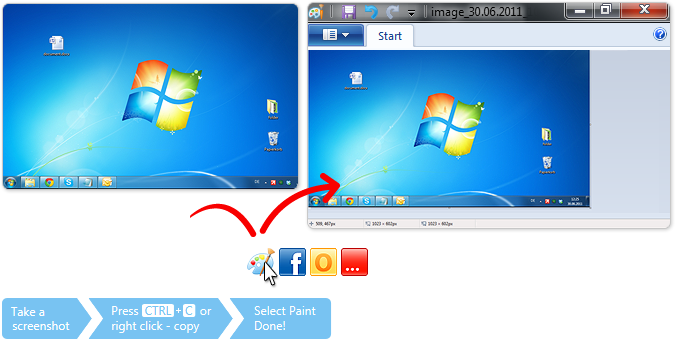 Normally, you press the button for “Print”, search for Paint in the Start Menu, Paint opens and you can add the screenshot with Ctrl+V or right click – Paste into a new page. With click.to it is much quicker. Just press the “Print” button, click.to Paint and Paint opens automatically, with all its editing features and your screenshot! Save and edit and, when you need to, use click.to Mail to send it on!